A computer-assisted comprehensive study focused on the second half of the 16th century is planned for the second phase. It will demonstrate historical changes in style based on the extension and development of the preliminary work done during the first phase of the project. This study will feature a comparison and evaluation of literary styles in both recensions of Latifi’s tezkere and Âşık Çelebi’s Meşâ‘irü’ş-Şuarâ employing existing stylistic analysis programs. The Latifi Project will use the Kâtib/Scribe reversible transcription tool developed at the University of Washington by the Newbook Digital Texts group for its Ottoman Turkish-related projects (which include the Baki Project and the Latifi Project). Kâtib/Scribe produces Arabic/Ottoman script output and Latin transcription simultaneously from Latin transcription alphabet input. The sample texts in two alphabets created by Kâtib/Scribe are standardized and fundamentally linked so that they can be used to generate a digital index, contextual index, analyses, and visualizations. Visualizations: 1. Word Concept Map; 2. Keyword Network Map; 3. Word Usage Map; 4. 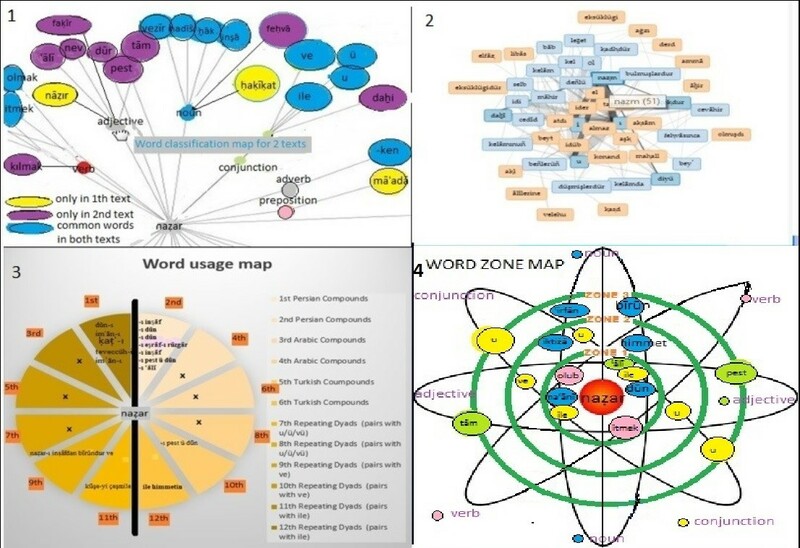 Word Zone Map. The first visualization will be derived from either a single text or the comparison of multiple texts. This visualization is in the form of a map providing comparative conceptual areas of words found in more than one text. The second visualization is an example of a word network map that displays the proximity grades of the words in the text. The third visualization shows grammatical structures, such as compounds in Arabic, Persian, and Turkish which are located to the right and left of the selected words. This will provide evidence for how certain morphological and grammatical structures varied over time. The results will make visible the contextual development over time of the vocabulary selected. The final visualization is the word zone map. With this visual mapping, we can examine the associative relationships among words. The associations that these relationships have established among different word types are determined and visualized in zones. All visualizations will have the option of displaying relationships within a single text or among two or more texts.